Find out what referencing style you should use and be consistent with it! Not as personal a choice as your dress style, unfortunately! You’ll need to check your departmental guidance or with your tutor which style they want you to use. For a quick guide with some simple, clear examples of references in different styles, try the Library’s referencing styles webpages. For more advice about getting started with referencing, see the Referencing 101 post on the Study Blog. Now you know which referencing style you should be using, find out how to use that style. 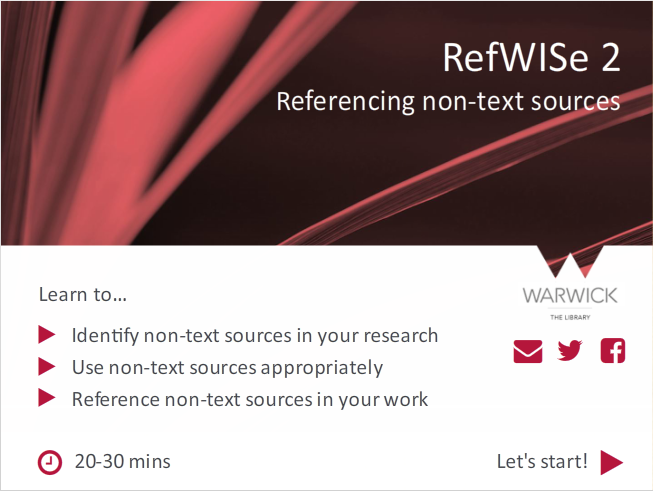 Check out our new RefWISe referencing tutorials on Moodle! These have been recently added to our PlagiarWISe and RefWISe Moodle course. There’s one on text-based sources (e.g. books and articles) and one on non-text sources (like images, graphs, TV series, YouTube videos and films). A range of examples is given in three styles widely used at Warwick: Harvard (an Author-date style), MHRA (a Footnote style) and Vancouver (a Numeric style). a) Learn how to cite different types of sources within your essay, how to use captions, as well as how to include them in the bibliography list at the end. What and when should I reference? Got a source with multiple authors and not sure whether you need to include all the authors’ names in your reference? Wondering what to do when you are using the same reference twice in an assignment or dissertation? What if some publication information is missing? How do you make a direct quotation? If you want to find and use images in your work, you can use Creative Commons licensed images which generally allow relatively free use of a piece of material. 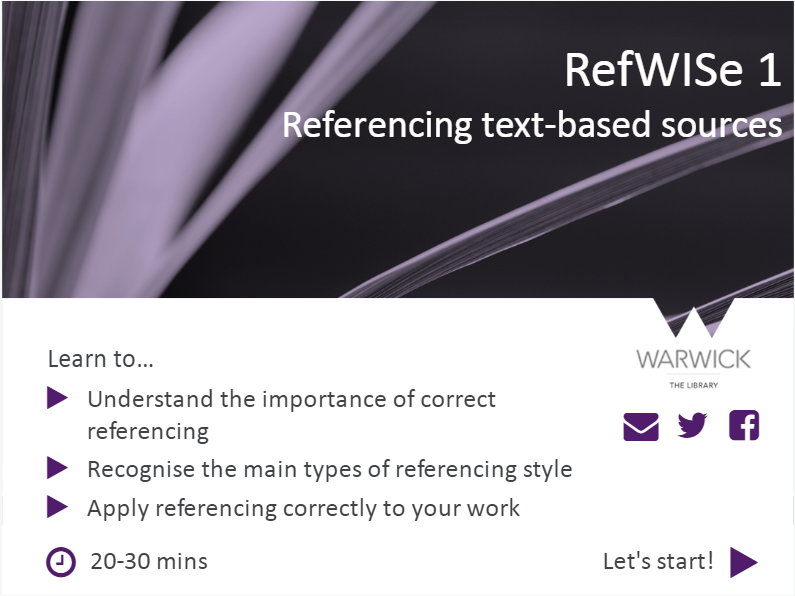 The RefWISe 2 tutorial takes you through how to find and attribute (reference) these for your work. The image used at the start of this blog post, for example, was from Pixabay. Have a system in place for managing your references, whether that is a list, spreadsheet or online reference management system. The Library can support you with using EndNote Online referencing software, but there are other systems available too like Zotero or Mendeley. Take a look at the Library’s EndNote Online support pages or book onto a workshop. For more support with referencing, don’t forget you can ask your Academic Support Librarian for help (find and contact your Academic Support Librarian) or drop by the consultation pod on floor 1 of the Library between 13:00 and 15:00 during term time. Now you know the secrets – good luck! Do you find referencing confusing? 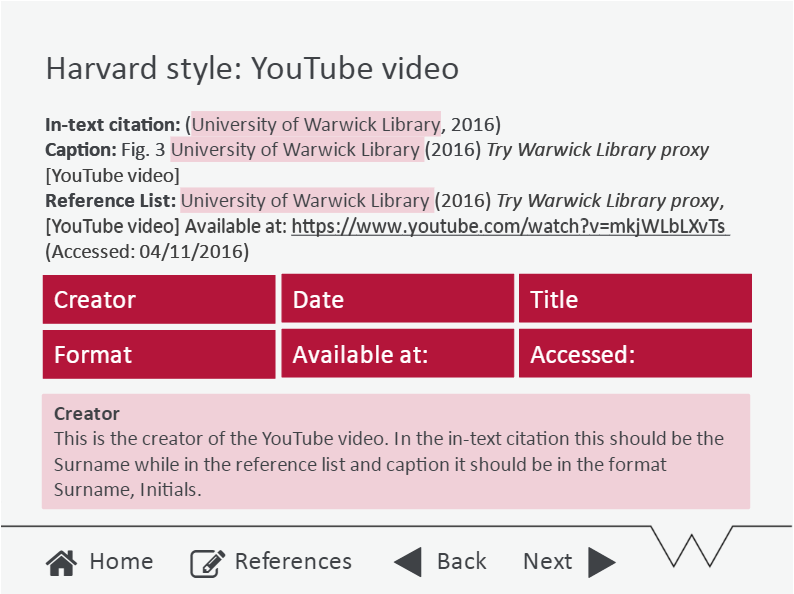 Have you tried any particular system for managing your references?Tweet us at @warwicklibrary, email us at libraryblogs@warwick.ac.uk, or leave a comment below.